The new BENDie petrol powered 4×4 mini dumper provides access even in the tightest corners. At just 730mm (850mm) wide the TRUXTA 4×4 is really compact and gets into places other units can’t. A BENDie mini dumper’s articulated chassis means the TRUXTA handles corners with minimum effort – just steer around bends and corners – no need to lift or reposition. 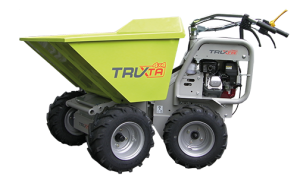 With a massive skip capacity the TRUXTA BENDie mini dumper offers excellent load capacity in and around sites and gardens. The well balanced robust unit fits through typical doorways (2ft 6” B300 or 3ft B450). Easily transportable from site to site, and compact enough to store. It’s the patented ‘steering pivot drive system’ that provides ultimate manoeuvrability in a compact size. Massive 300kg or 450kg skip capacity and flotation tyres fitted as standard. 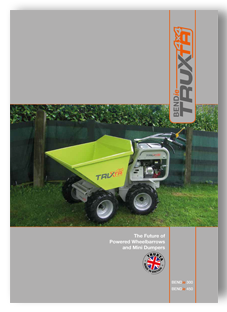 Robust heavy duty construction and a well balanced skip means the TRUXTA is built for all sorts of materials and tough terrains. The fail-safe dead-man brake system and intuitive hydrostatic controls gives the TRUXTA operator the safest possible operation. Easy access to the fuel filler cap and daily check areas for service.